Aaron Hicks doubled home the winning run in the 11th inning , just after a foul ball to an ankle sent him sprawling to the dirt face-first in pain, and the Yankees clinched an AL wild card for the second straight year with a 3-2 win over the Baltimore Orioles on Saturday. 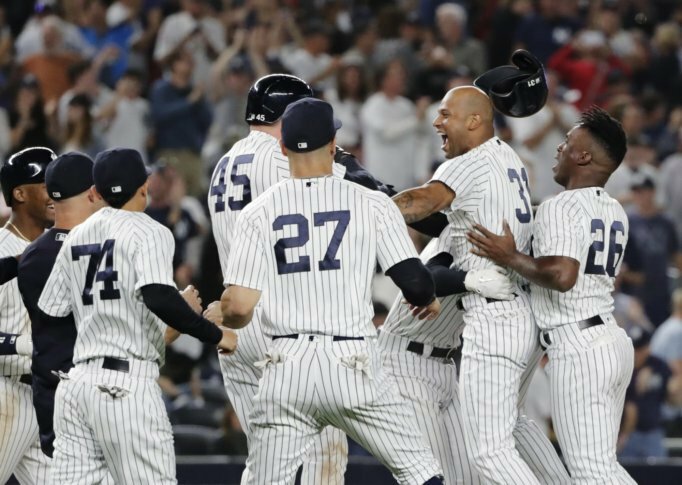 NEW YORK (AP) — Aaron Hicks and the New York Yankees reached the playoffs the same way they played the regular season: They got hurt, stood up and kept on going. “Everyone in that room understands that we feel just as capable as any other team that’s going to have an opportunity to do something special,” said Boone , who set off a celebration at old Yankee Stadium with his pennant-winning homer against Boston in 2003. Chad Green, Chapman, Dellin Betances, Zach Britton, Jonathan Holder and Tommy Kahnle (2-0) each pitched a scoreless inning in relief of Lance Lynn. Holder escaped a second-and-third, no-outs, and bases-loaded, one-out jam in the 10th , helped by first baseman Luke Voit’s diving catch of a Chris Davis liner with the infield in. “I would imagine if we win big, we’ll look back and they’ll have played a huge role,” Boone said. “Man, this has been the craziest year in my life,” Voit said. Baltimore scored against Lynn when Cedric Mullins’ tapper in front of the plate drove in a run in the third , and DJ Stewart singled in the tying run in the fifth . Lynn got out of bases-loaded trouble in the fifth when Adam Jones grounded into a forceout. Stanton struck out, and the foul ball off Hicks’ foot caused a two-minute delay. Hicks took a ball and then lined a low, inside slider down the left-field line. Gregorius sped around the bases as left fielder John Andreoli picked up the ball by the wall, and Gregorius slid in headfirst ahead of shortstop Jonathan Villar’s relay throw and spread his arms wide. Hicks said X-rays on the ankle were negative — but his necklace was cut in half during the celebration. Now the Yankees will try to stay ahead of the A’s and host the wild card. Judge, a veteran of last October’s run, kept the day in perspective . Baltimore dropped to 44-110, one shy of the franchise record for losses set by the 1939 St. Louis Browns. The Orioles entered 60½ games out of first place and are assured of next year’s top pick in the amateur draft. Steve Wilkerson was thrown out at the plate twice, by Torres after the second baseman retrieved Sanchez’s errant throw and by Judge on Caleb Joseph’s single to right in the fifth . Wilkerson threw out Torres trying to score from third on Andrew McCutchen’s seventh-inning grounder to third. LHP J.A. Happ (6-0, 2.39 ERA with the Yankees; 16-6, 3.62 overall) starts Sunday’s home regular-season finale and is lined up to start the wild-card game. RHP Alex Cobb (5-15) starts for the Orioles.